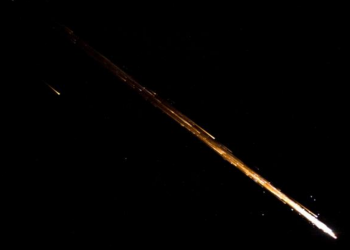 The eighth Cygnus resupply mission to the orbital outpost departed ISS and completed 12 days of free flight events ahead of a destructive re-entry that occurred on Monday. 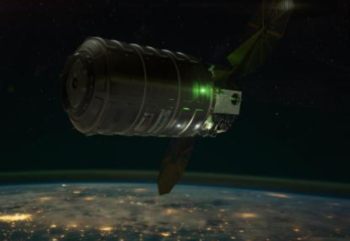 Before the end of its mission, Cygnus conducted a variety of activities, including the deployment of 14 Nanoracks Cubesats as well as several experiments for Orbital ATK for potential future uses of the spacecraft. Orbital ATK entered the second phase of the OA-8E Cygnus’ resupply flight to the International Space Station, a mission that was completed exceedingly well. “Overall, this has really been a great mission. I really would describe it as flawless,” noted Frank DeMauro, Vice President and General Manager of the Advanced Programs Division for Orbital ATK Space Systems Group, in an interview with NASASpaceflight’s Chris Gebhardt. Like the craft it took to orbit, Orbital ATK’s Antares rocket also earned excellent marks for its performance during the mission’s launch on 12 November. “Antares performance on OA-8 was excellent, and matched very well the performance we observed on the prior OA-5 mission,” noted Kurt Eberly, Vice President and Antares Program Manager for Orbital ATK, in comments to NASASpaceflight. For Cygnus, the craft also received high praise from NASA for its use in hosting the TangoLab-1 experiment. TangoLab-1 was tested to determine the viability of using Cygnus as a laboratory while docked at the International Space Station and hosted a radiation experiment during the course of its 21 days of berthed operations. In effect, TangoLab-1 was a pathfinder experiment, testing the feasibility of operating experiments on and using Cygnus as an additional laboratory element for the Station during future missions of the craft. After three weeks attached to the international outpost, astronauts aboard the Space Station removed Cygnus from the Node-1 “Unity” Nadir (Earth-facing) port on Tuesday, ahead of the spacecraft’s anticipated Wednesday departure. 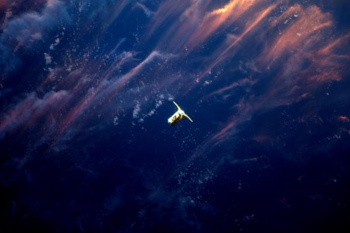 Unlike previous unberthing events, Cygnus was not moved directly below the International Space Station. Instead, NASA astronauts Mark Vende Hei and Joe Acaba used this Space Station Remote Manipulator System – robot arm – to maneuver Cygnus above the Space Station. This maneuver was done to aid NASA testing and data acquisition for the upcoming Commercial Crew transportation program, set to begin in 2018. After that data was collected, the ISS crew maneuvered Cygnus below the International Space Station to its release position. After its release from the end of the Station robotic, Cygnus fired its thrusters to begin moving it away from the Station – at first moving outside of the Keep Out Sphere from the orbital laboratory. Once Cygnus was successfully away, controllers in Dulles, Virginia, fired the spacecraft’s thrusters again to raise the vehicle’s altitude from that of the International Space Station’s into a circular 450 km orbit. This maneuver set Cygnus up for the next phase of its mission – the release of 14 cubesats. 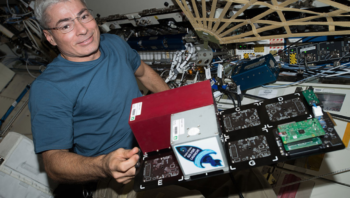 “We have 14 cubesats to deploy – by far the most we’ve deployed so far in all of our nanoracks missions,” noted Mr. DeMauro. After those Nanoracks Cubesats were deployed, Orbital ATK controllers put the OA-8E Cygnus through a different set of free flight experiments to demonstrate the craft’s versatility and attractiveness to potential future customers. Some of these experiments include additional testing of Cygnus’ avionics during a longer period of free flight than has previously been endured by prior Cygnus spacecraft. But perhaps the most exciting test this month came when controllers varied the pressure inside the Pressurized Cargo Module (PCM) element of the craft. “One of the things we’re going to do is vary the pressure inside the cargo module,” noted Mr. DeMauro. “That capability is one we think will be very attractive to potential users of the Cygnus as a science testbed. Following the deployment of the Cubesats and the free flight experiments, controllers set Cygnus up for a destructive reentry into Earth’s atmosphere over the southern Pacific Ocean. For this mission, Cygnus was carrying more than 2,900 kg of disposable cargo from the Station for NASA. “That’s significant because it’s the most NASA has packed so far on to Cygnus and we know that’s a critical service,” related Mr. DeMauro. 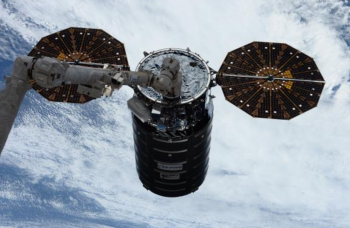 While 2,900 kg of disposable cargo is a significant increase to what Cygnus has previously taken from the Station, Mr. DeMauro noted that the craft could take much more than it is currently packed with. “We’re required to take down as much as we take up. So on this mission we took up 3,350 kg. We can take 3,350 kg – or more than that – down. It’s just a factor of how much the astronauts can pack into the module. 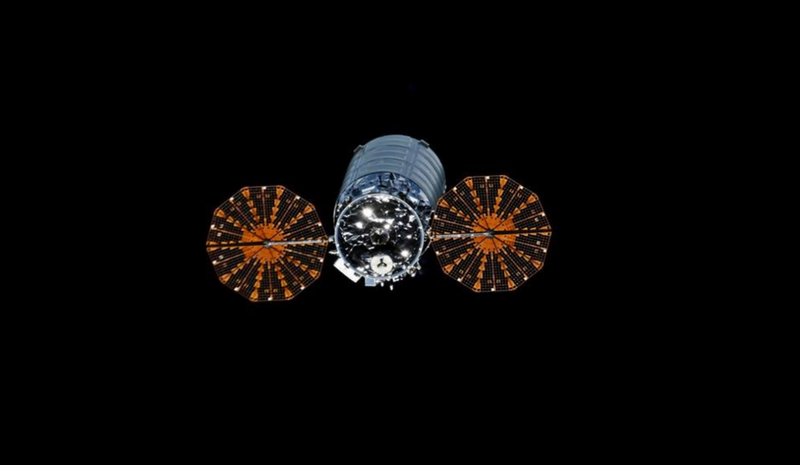 Under the nominal plan, the OA-8E Cygnus mission came to an end on 18 December. 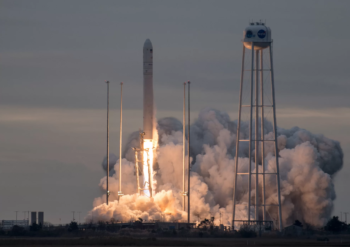 Following that, the next Cygnus mission – OA-9E – is slated to occur sometime in spring, and will launch on an Antares rocket from the Mid Atlantic Regional Spaceport in Wallops, Virginia.